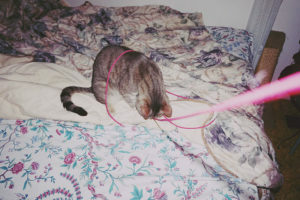 I’ve been on probably the most insane shopping spree of cat stuff ever. 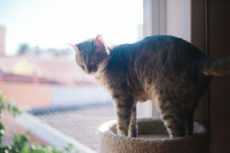 I bought Avery a couple of medium sized cat trees and a number of different small ones when Thomas and I first moved into this big ol’ house from our studio apartment back in September. 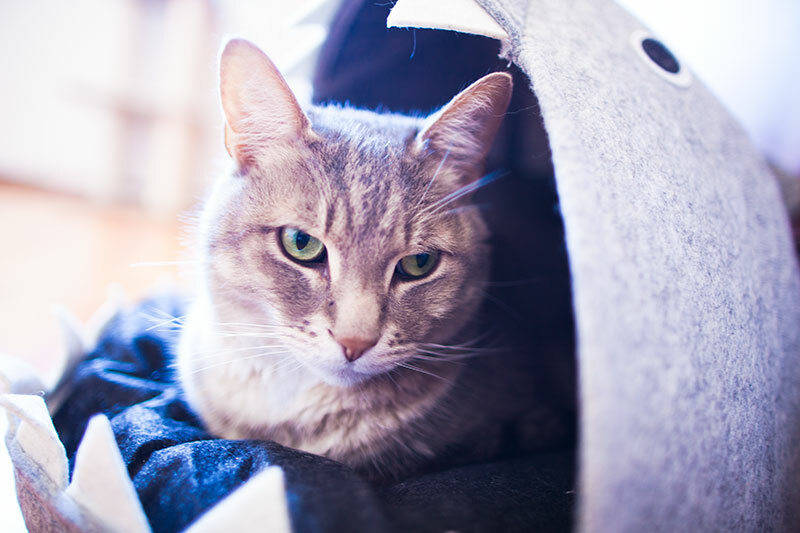 We bought a single self-warming cat bed, for Avery as well – the Trixie Minou – which was a huge hit. I didn’t immediately go on a shopping spree after we took in our new, second cub, Bjorn. 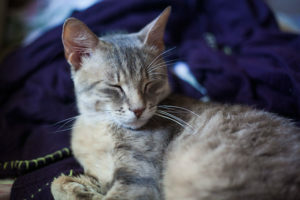 He’s a stray/feral from the neighbourhood who just wouldn’t leave, and while he’s been adjusting ridiculously well to indoor life, there have been a few hiccups, including a number of “accidents” and Avery not getting along all that well with him for some time. 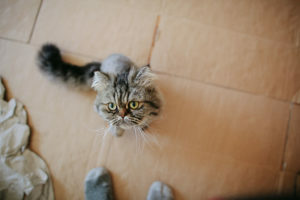 Initially, I did my best to DIY cat furniture solutions – and made a slew of cardboard cat condos for the two cats that worked out great – until Bjorn started peeing in a cardboard condo every so often. To prevent further accidents in places that aren’t litter boxes, I’ve not replaced the cardboard cat condos that have died a watery death. 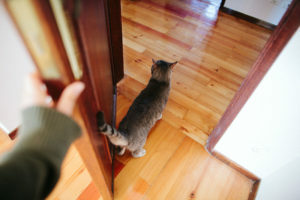 Instead, I’ve tried using blankets and gone on yet another mini spree to buy a number of different cat products the kitties can sleep and play in, so I can reduce as much of the cardboard as possible in this house, since Bjorn seems to associate it with the kitty loo. My goal was to replace as much of the cardboard as possible while simultaneously still giving Bjorn and Avery enough spots to keep out of each others’ ways. The latest cat beds in my haul? A banana cat bed and an adorable shark bed for cats. 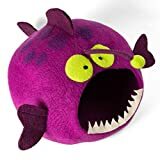 Having been pretty displeased with the banana bed (it didn’t hold it’s shape & was overpriced considering what I paid for it), I sent it back, but the particular shark bed I chose I am enamored with. It holds its shape well, is a nice size, I’m pretty sure it’s durable enough to stay looking great over time, and honestly, I can’t get over how funny it looks in pictures. I also love the fact that it’s made of felt, and is a grey shade – the same as my two cats, which means less fur will show up on it. Also love the fact that the pillow inside it is easily replaceable. I think I may grab a dark grey fabric for that as well to really prevent Avery & Bjorn’s hair from showing up on it so much. 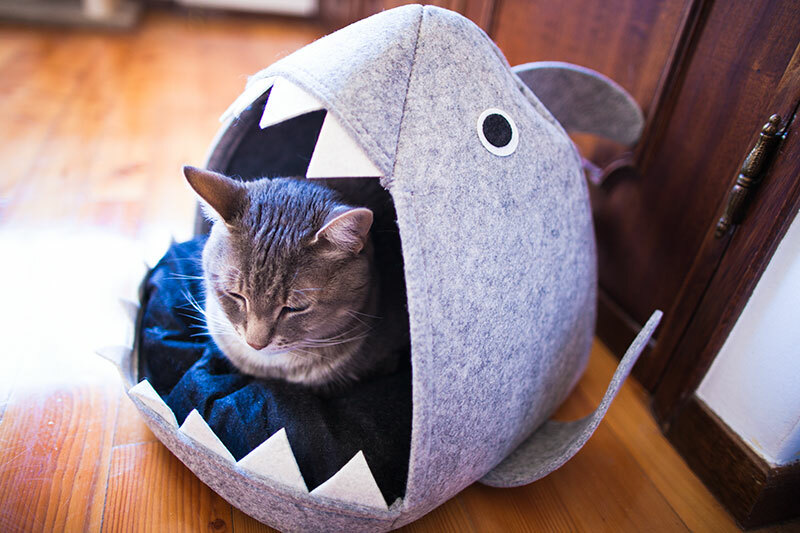 There’s quite a lot of shark beds for cats around, and while I’d only seen pictures of the single most popular circling around the net, the most popular is actually not the one I chose when I finally got down to buying a shark cat bed, since it turned out to not be my favourite. Still super cute, but the one I ended up with is a lot more up my alley. 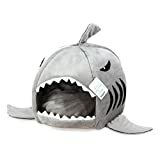 I’ve done up a list of my favourite shark pet beds, as well as a list of similar alternative beds – mostly fishes – that may be cute seconds sitting next to a shark pet bed if you have a couple cats who don’t like to share. They all follow that theme of your-pet-sleeping-in-an-animal’s-mouth, which I think is amazing for cute picture opportunities and just all ’round happy moments when you look over and see your cat napping in one of these. 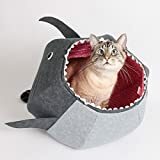 Let me know in the comments section which shark cat bed you think is the cutest, and if you can think of alternatives that may look nice paired alongside a shark cat bed. So far, I’m considering grabbing one of the fish beds. 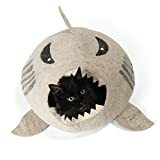 This is the most popular shark bed for cats by far. I think it’s ridiculously cute, and while it was my second favourite, I’m a sucker for felt and more simple designs, so I went for the Zeller shark bed instead (which I’ll be showcasing later). 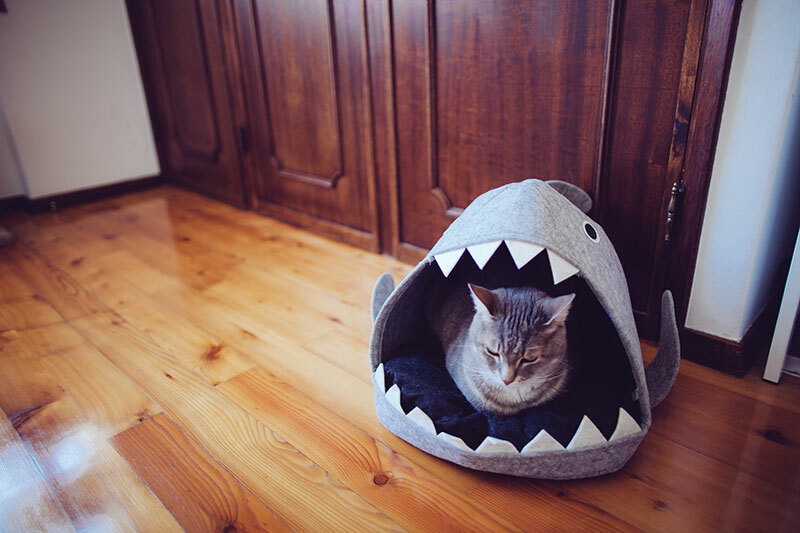 I adore this picture of a cat yawning in a shark bed – that looks like a shark attack! So much potential for amazing Instagram pictures here. If you’re into the idea of a 100% all-natural wool cat bed, there isn’t, in my opinion, a better shark bed for cats than this. Have a look at how amazing it looks like in this reviewer photo. So something I would consider grabbing, were I not concerned with Bjorn potentially peeing in a cat bed one day as he’s done in the cardboard box condos I made for him. Maybe one day once he’s settled in enough! 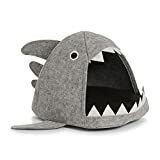 I genuinely believe this is one of the most whimsical, fun looking shark pet beds out there – it’s just so stinkin’ cute! 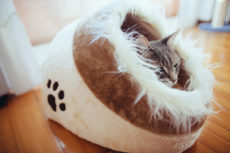 Cats look so crazy cozy and happy in this thing, and honestly I feel it looks so much more quirky than any of the other designs, I can imagine buying it as a gift for a number of cat-owner friends and family members. 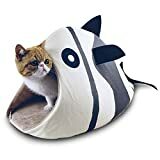 Never would’ve thought a hybrid cat tent that’s also a cat bed and a shark theme would exist, but here we have it! Apparently this thing is one heck of a product, well loved by cats and yet still managing to hold it’s own in terms of durability. I’d love to test it out, but I can’t seem to find it easily to get my hands on one here in Europe. That ever-so-popular cat shark bed? It’s available in more colours than the standard grey! Prefer to have more fun with colours like pink, blue, and red? You can absolutely go that route. 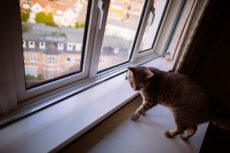 Personally, I think the blue is my favourite, behind the standard grey, however, as I genuinely love grey coloured cat things, like grey cat trees for instance. The cat bed I’ve got, that I’m completely enamored with. It’s felt, it’s just big enough for my extra-tall, large cat Avery. Took a risk with this one as I typically am not a big fan of buying products that don’t have many reviews, but I’m really happy I did. 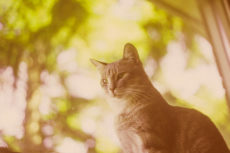 It’s lovely – stupid adorable, stands up very well, holds its shape, and has a sort of crafted aesthetic that I adore. 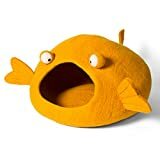 This ridiculous looking angler fish cat cave is absolutely the most fun and comical looking thing ever. If you’re looking for a little bit of humour in a cat bed, I can’t think of a better option. 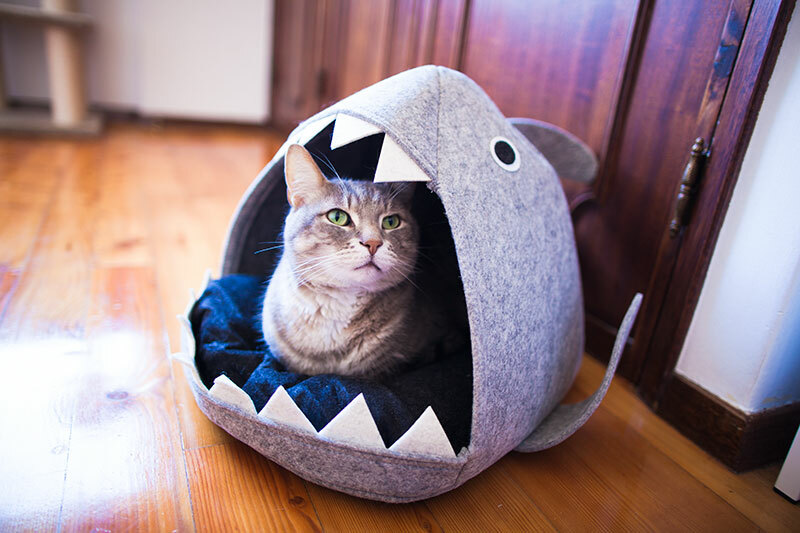 Such a sweet looking fish cat bed that’s actually quite a lot like a tent considering it’s pretty triangular shaped. Also comes in the colour red, which I think I prefer just a smidgen more since I’m a huge fan of bright colours. 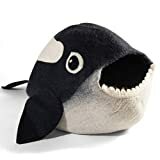 I don’t think I ever would’ve thought an orca whale cat bed would exist, but it absolutely does. I can imagine this being so cute in an all white and black room; just a little pop of cuteness. One last one from Twin Critters that I really, really love: this koi cat cave. To me, it has the expression of a blow-fish, which is so amusing, it’s ridiculous. Bright orange, I think it’d pop in any room, which I really like, too. So stinkin’ adorable. 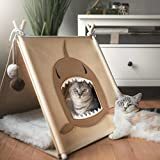 Your Thoughts on Shark Beds for Cats? 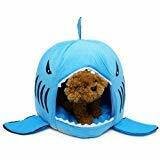 What do you think about pet beds shaped like sharks? 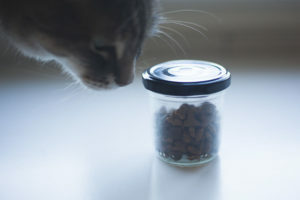 Would you ever grab one for your cat? Which design-wise do you like the most? Are there other animal shaped cat beds you think are cute? What about cat beds shaped like odd things like fruit or cars? 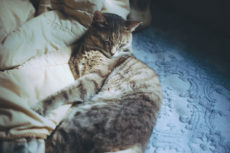 Do you like pet beds shaped like animals and other things like that, or do you prefer standard looks that don’t stand out as much and blend into the flow of a room more?